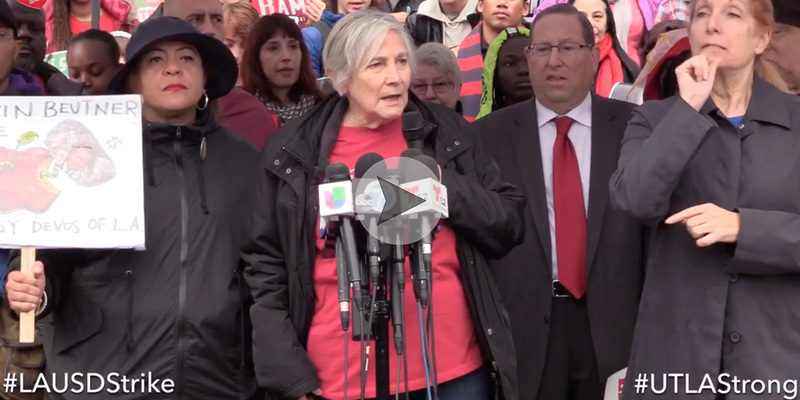 On Day 3 of the Los Angeles teachers strike, NPE President Diane Ravitch spoke at a rally in front of Alexander Hamilton High School. You can watch the video below. Diane also wrote a blog post about the strike and how the spread of charters has devastated the district. The UTLA understands exactly what’s going on. Its President Alex Caputo-Pearl and his members understand that the billionaires bought the school board so they could expand the non-union charter presence. Charters now enroll 20% of the district’s children. A day earlier, the UTLA held a mass rally in front of the California Charter Schools Association, the billionaire-funded lobbyists intent on destroying public schools in the state while prohibiting any accountability for charter schools and fighting any limits on charter school growth. The billionaire-bought LAUSD has starved the public schools, which helps the charters. From coast to coast, news outlets are making the connection between the unwillingness of the LA School Board to adequately fund its public schools and the bleeding of dollars from public schools to charters. Jacobin magazine explains the “hostile takeover” of L. A. public education by billionaires. The Washington Post’s Valerie Strauss makes the connection between the strike and privatization. So does Rebecca Klein of the Huffington Post. This article in New York Magazine connects the dots between charters and the strike. And Rachel Cohen calls Democrats to task in her article, LA Teachers Are Mad About Charter School Growth. Why Don’t Democrats Acknowledge That? 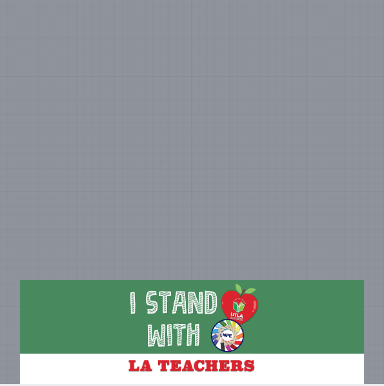 Be sure to show your support for the teachers of Los Angeles and their fight for public education by clicking the image below to add our frame to your Facebook profile picture. You can also support the strikers, parents and students in Los Angeles through a contribution to the AROS solidarity fund. From coast to coast, charter schools are draining our public schools by taking away the funds schools need for reasonable class sizes, counselors, social workers and decent living wages for teachers. We cannot afford a dual school system. The Network for Public Education and the Network for Public Education Action have been fighting the fight against privatization through vouchers and charters with relentless persistence for six years. The message is getting through. Please make a contribution today so we can carry on that fight. And visit our new websites (NPE and NPE Action) to find reports and resources on fighting the battle against privatization from coast to coast. Teachers should not have to leave their classrooms to get the attention they deserve.